The Victorian style in the mid 1800’s was the prevailing architectural, art and design style in California (and all of the US and Europe) that made the Gold Rush days of San Francisco stylish. In fact, in Santa Barbara, the County Courthouse was a big wood ornate Victorian building before the 1925 earthquake. First the Gold Rush days and then the trans-continental railroad in 1868 brought people, money and trade to California (faster than ships could round Cape Horn and the Straits of Magellan) and “civilization” to the wild west. The new, more educated population, brought with it the tastes for the Arts and Crafts or Craftsman style and design, all the rage in Europe and the Eastern states. The oldest non-Spanish known painting in California, done about 1850, is of a mission. Every once in awhile an artist would venture out, like a tourist, to see the most accessible locations of missions, but these were one-off’s and not the subjects or main focus of exhibitions and publicity. These various artists painted the peculiar, ghost-ridden buildings and these random paintings of the missions were more like curiosities. Every once in awhile one would be used for newspaper stories and novels which was the way the rest of the US and Europe learned about them. Of course, compared to the Eastern seaboard, travel along the California coastline in 1870 (and mostly throughout the western states as a whole) was primitive; dirt roads in a buggy… when there were roads and horseback when there were not. You can image that getting off the beaten trail was hazardous. The trail that ran the length of western California was the 200 year old pathway called the old “Camino Real” of the Spanish padres and their commerce. Spread out along the Camino Real, about a day’s ride apart, were the 21 old Spanish missions. Of course, without the proper publicity, the missions would have never been “discovered” as a romantic, popular part of history before they completely fell apart into ruin… which they were doing quickly by the 1870s. But, artist’s paintings were the perfect visual image for publications feeding the Eastern states and European curiosity and hunger for anything Western. And this is where our story begins! 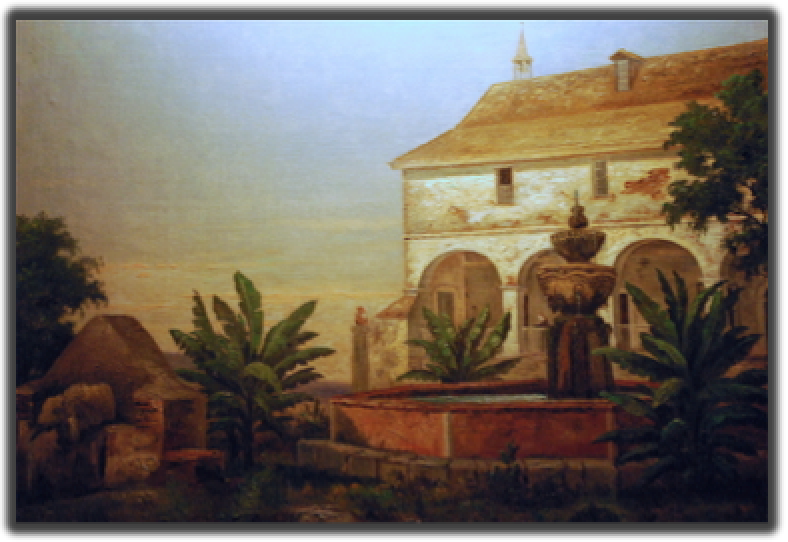 For some reason, in 1874 an established artist named Henry Chapman Ford got the idea to paint all 21 of the missions of California as a complete set plus added other paintings of details of the missions to complete a collection of 40 oil paintings. And as it turned out, he was the first person to ever have painted all the missions as a collection or set. This was a MAJOR 12 year undertaking to make the perilous journey, carry the supplies and protect his creations as he travelled the uncivilized lower half of California in ships, buggies and by horse. But HC Ford knew he had hit on something big… and this may have been a matter of being in the right place at the right time. 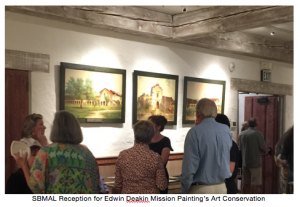 His paintings of the old Spanish Missions were the perfect inspiration, image and style to appeal to the public who craved the modern Arts and Crafts Style. 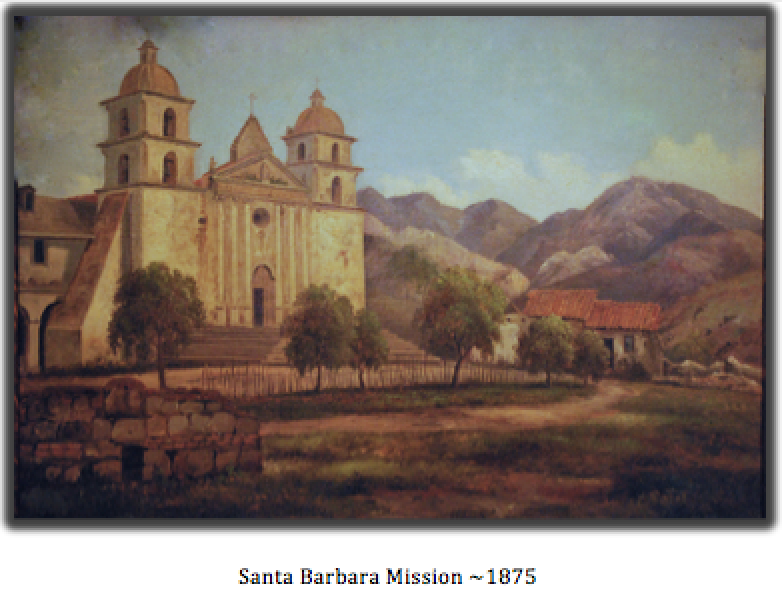 And the Santa Barbara Mission was his favorite subject. He even framed his set of the 21 missions with simple quarter sawn oak Arts and Crafts Mission style frames that were the perfect selling point for his public that wanted nothing to do with the ornate Victorian glitz. Ford made a career out of his mission paintings expanding his appeal to the public with engravings from his paintings, painted copies and published books of his images. Once they were widely published, used as illustrations in newspapers and magazines, the fire of desire was lit for everything Mission Style. Designers made accessories, architects designed buildings and the Spanish Revival movement was underway, not only in California but throughout the Southwest! Maybe it would be accurate to say Henry Chapman Ford’s work was the first art to go viral in California! And with all the publicity he got, it certainly made Santa Barbara more famous as a destination. By the end of the 1890’s, about 20 years after Ford, an accomplished and well respected Englishman artist moved to San Francisco after the Chicago fire. 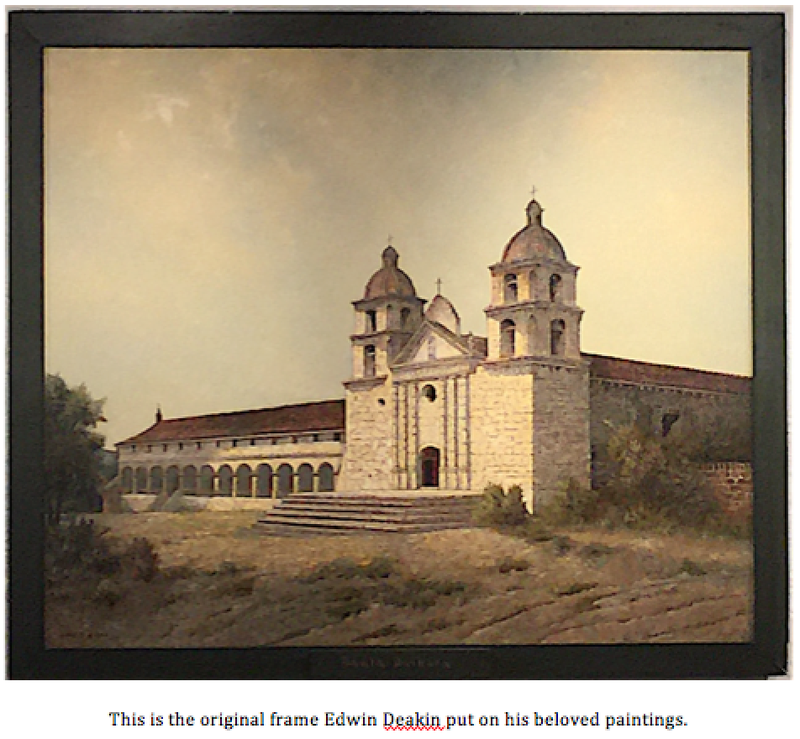 Edwin Deakin (1838-1923) had actually visited California a couple of times before and his first painting of the Santa Barbara Mission was done in 1875. 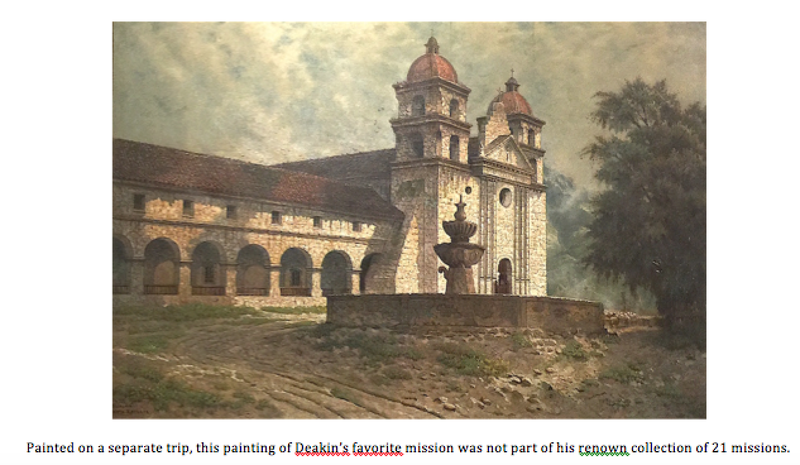 After seeing the popularity of the Spanish Revival, he set out to do what Ford had done and in 1897 he undertook the same challenge of travelling El Camino Real to paint a complete set of 21 paintings of all the Franciscan missions of California which he completed only two years later in 1899, despite the hardships of travel to the remote locations. The public response to Deakins’ work was very enthusiastic and fueled a movement already in motion to save and restore the missions which were in very bad condition and getting worse every year, many heavily damaged due to earthquakes plus poor or weak construction. Deakin also had learned that the market was hungry, still, for everything Mission. In fact, the Mission Style widely known now through reproductions of images in the press would be the preferred style of California well into the time of World War II and is popular even today. Like Ford, Deakin made a career out of his reputation with the missions, publishing books, printing books and selling images. Both of the mission series collections by Ford and Deakin were famous in their time but the story of what happened to these iconic paintings years later is beyond interesting! Henry Chapman Ford’s 1st set of original oil paintings (because be made two other sets, grossly inferior in quality) ended up being purchased by Mission Inn owner Frank Miller. Frank was “all in” when it came to the new popular Mission Style and Spanish Revival investing $millions to build his Hearst Castle style hotel and recognized this collection of paintings by Ford as iconic and as “trend setters.” All of the artwork at the Mission Inn was for sale through the years and the hotel was kept packed with art, artifacts and antiques for people to buy. BUT, the series of Missions by Ford was never broken up nor sold. I trust they were too valued and historic. 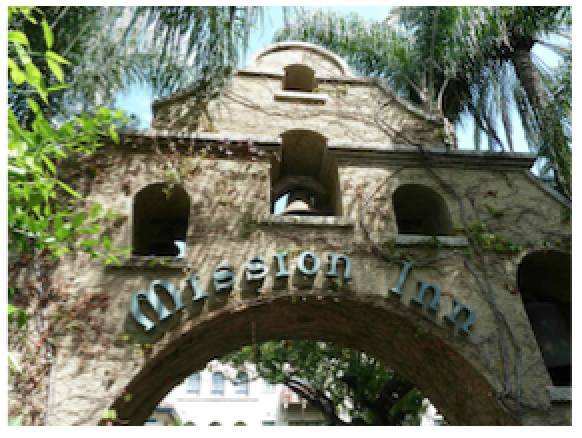 In fact, the Mission Inn was also famous for their Mission Style decorations and furniture made in their own workshops… another major promoter and supplier of the Spanish Revival. Fast forward now to 1985 when the Mission Inn had stood empty and fenced up for years as one contractor after another failed in their renovation efforts. Artwork and antiques had been sold off, as ownership passed through several hands, but one day in 1985 I got a call from the Historic Mission Inn Foundation who wanted me to explore with them the deplorable storage areas and look for significant art objects. In the attic, almost as if they were hidden, we found Henry Chapman Fords Missions of California in a place designated at “Pigeon Row.” Any dramatic image you may have conjured up in your imagination doesn’t match the true setting and smell where we dug out some of the most important paintings in California and US history. 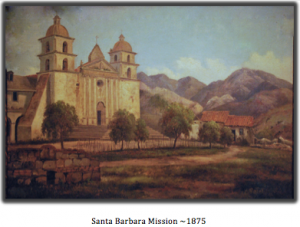 Few works of art have influenced and set trends where society changed its look and culture because of the vibe, the story and the history that they told like these paintings of Santa Barbara and the others of this collection. The newly found paintings were in terrible shape: Many were horribly water damaged, very dirty, very badly restored many times, many had holes, tears and were mangled. It was a pitiful sight. The preservation and restoration work was entrusted to Fine Art Conservation Laboratories in Santa Barbara, CA who worked miracles and took to heart the spiritual significance of the project. The highest professional standards were observed and the final results were perfect. Paintings of Missions of CA Help Establish Mission Style and Spanish Revival – Preservation and Art Restoration Story from Scott M. Haskins on Vimeo. Like Henry Chapman Ford’s mission paintings, the collection painted by Edwin Deakin was never split up… or sold by Deakin… on purpose! He loved so much his creation that he put an ultra-high price on it so it would never sell. After Deakin’s death in 1923 the paintings went into storage and there, were forgotten until supporters of the artist remembered them and went looking. Elaine and Howard Willoughby bought the collection and donated them to the Santa Barbara Mission Archive and Library in the 1950s. Although in excellent condition compared to the paintings by HC Ford, after 120 years, they needed a little TLC. In 2016, the collection was cleaned , revarnished, the frames were repaired and preserved and the Franciscan archive reorganized their viewing area to accommodate the viewing of these iconic national treasures by the public. The paintings of Santa Barbara are among the most dynamic and are favorites. Restoration of the paintings is important not only for the public’s pleasure or for the sake of historians today, but for the up and coming generations as well. The time in which these paintings were created is just outside that of living memory today and will be even further outside the memory of our children and grandchildren. Art is a magnificent way to tell the stories of history as it can be free from bias and is open to interpretation. Therefore the work that the art conservators have done to protect these artworks is vital and a great benefit to our communities in the future. Mission Santa Barbara stands out amongst the other missions because of its continued use throughout its history. It was established in 1786 and has been continually in use, first by Catholics and then still after secularization post Mexican independence in 1821. While some friars that resided here left for Spain after California gained its independence from Mexico, Franciscan friars that were fleeing anti-Catholic sentiments in Germany came to live in the United States where they would have freedom of religion. This celebration possibly would not be taking place without the artists that promoted interested in the missions, so much so that mission-style is still admired today. It currently also houses an archive library that is an independent non-profit research institution and is the oldest library in California that remains in control of its founders, the friars. It is also a major tourist attraction in Santa Barbara while still serving as the parish church. There is a great book put out by the Santa Barbara Mission Archive – Library on Deakin’s 21 oil paintings that FACL worked on, plus the corresponding watercolors that belong to the Santa Barbara Historical Society (now the SB Historical Museum). Search on Amazon for a copy. Thanks are expressed to Oriana Montemurro and Virginia Panizzon, painting conservators at FACL, for their skill and professionalism that were put into the work on these paintings. It was truly a labor of love. It’s been exciting, a great pleasure and honor for us to provide painting conservation services for the Santa Barbara Mission Archive and Library (SBMAL) on these wonderful paintings by Edwin Deakin. For us preserving and restoring these wonderful paintings for our generations in the future feels like there is a social conscience part of our work. If you enjoyed this article, the video, if you are a collector of this kind of art and/or enjoy museums and historical sites etc… please leave a comment! !